If been working for a while now Anderson PowerPoles and started to apply them to all my newly build 12V/13.8V powered equipment. 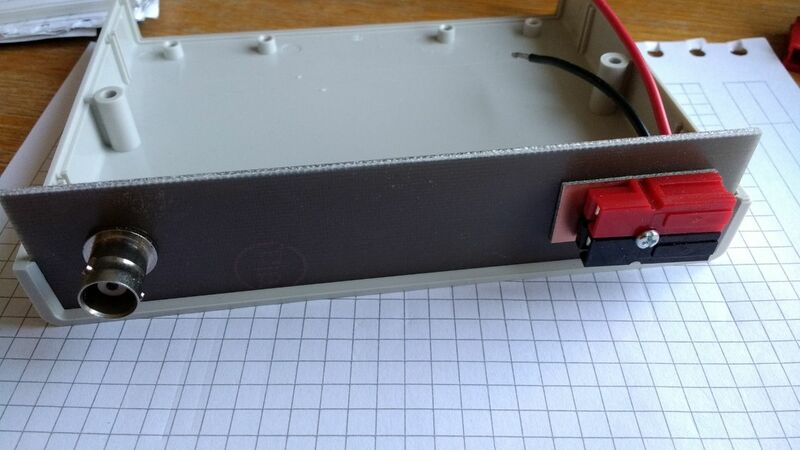 I have modified my power supplies to have a powerpole connector installed so there is starting to form a "standard" in the shack. But I have also a ton of old projects which also are powered on 12V/13.8V (bitx40, iler20,variouse measurement tools etc). So I started to retro fit them. A lot of the projects has enough space to apply the 1462G1 Powerpole Mounting Clamps (product link and mechanical drawing link) but some om my rigs like the QCX just don't have enough room on the inside to allow the the combination of the connectors and plates installed. 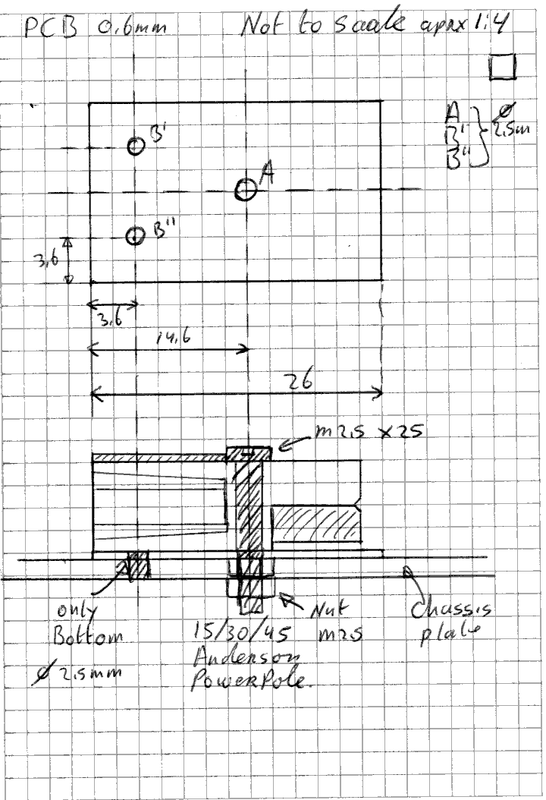 When using the plates you do need a space of at least 24mm width, a height of 27mm and a depth of 15mm. For my QCX that was impossible, so I started to think for another solution. When you mount 2 powerpoles together the have a alignment hole in the middle. 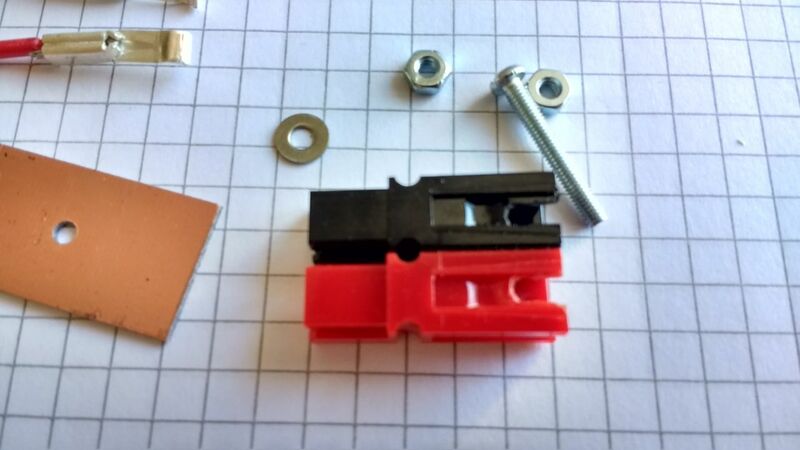 Which I have used in the FT-817 Anderson PowerPole Add-On to strengthen the mount of the connector to the 3D printed part. 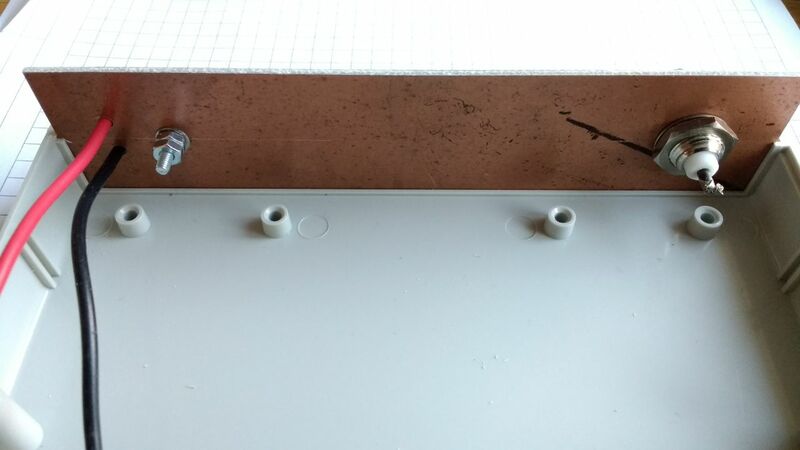 It is easy to use that hole to mount the a pair of connectors to the chassis, but the powerpoles have molded-in dovetails which you have to keep in mind when you want to do that. 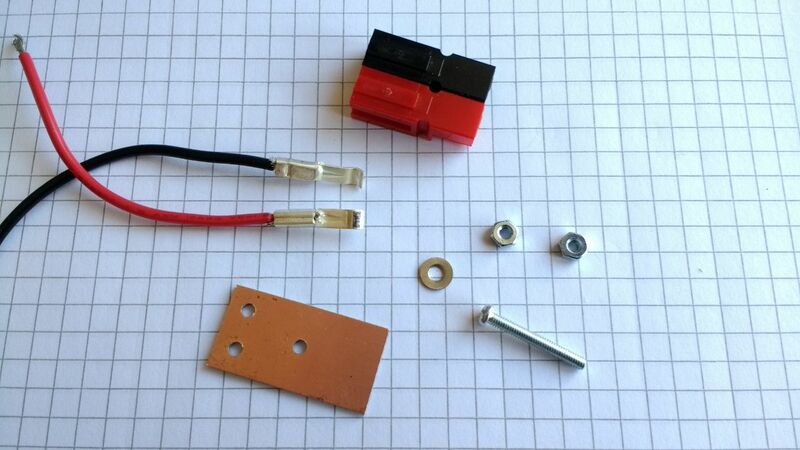 For that reason I use a small piece of PCB (aprx 0.6mm thick) to act as a lift for the powerpole. That way the inserted connector doesn't rub the chassis. 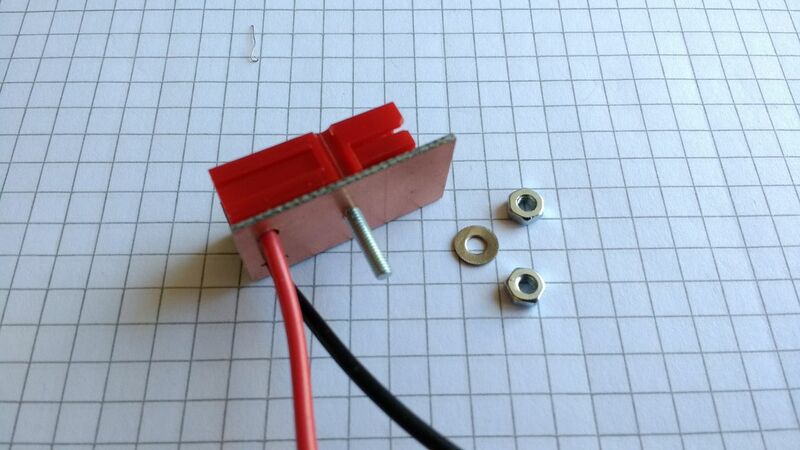 And it also can be used as a drill plate for the chassis holes. The idea is sketched below. The PCB has been cut to size and the holes are drilled. Next you take over the holes in the powerpoles so the wires can dive into the chassis. 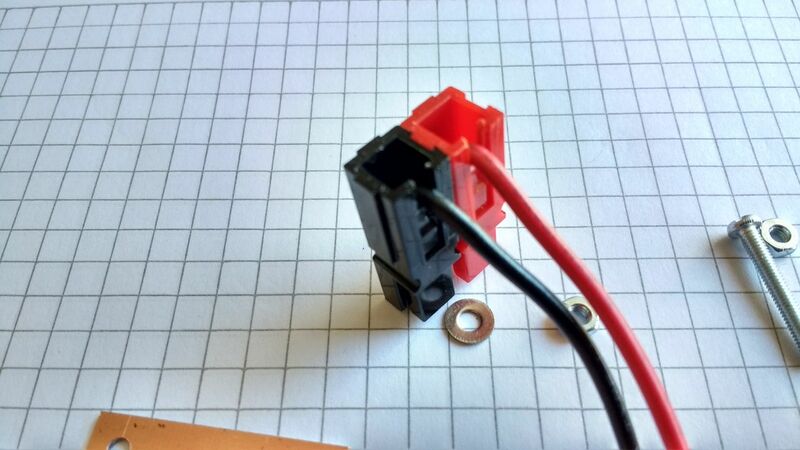 And file a slot in the powerpoles in which the wires can slide when installing the inserts. Connector wires to the inserts and install them. Bend them in a angle to match the hole in the mount. Insert the 2.5mm screw into the powerpole and stack everything up to see if everything is correct. When every thing fits you take the powerpoles from the mounting plate and use the plate as as a drilling template for the chassis. 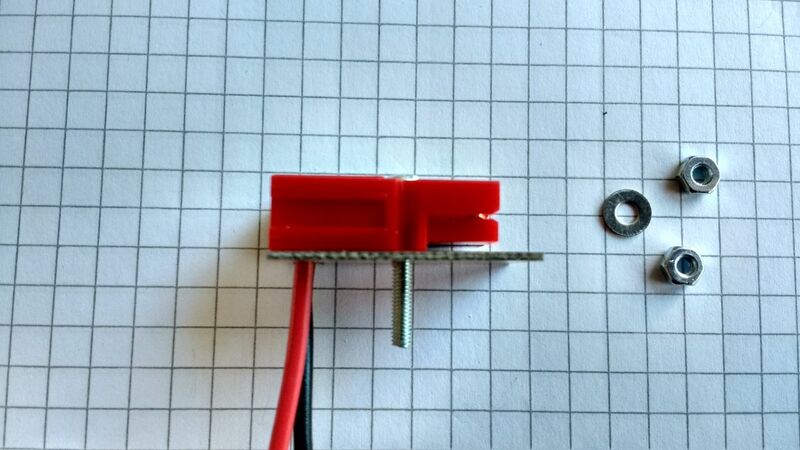 Note : I didn't have any single sided PCB of 0.6mm, so I used a double sided instead. Of course you could use any kind of plastic or even aluminum sheet. And when installed it almost doesn't use any space inside. So now my QCX has a Anderson PowerPole connector .